At press time, a final site plan hearing was scheduled for March 21 for a new QuickChek convenience store and gas station at Route 22 and County Line Road. Headquartered in Whitehouse, QuickChek Corp. plans to build a 5,496-square-foot store and a fivepump gas station. Nearby property owners have repeatedly voiced complaints about traffic congestion at the intersection during rush hour. Two Route 22 gas station owners also are objecting to the proposal. QuickChek is required by the Readington Zoning Board to reach an agreement with the state Department of Transportation regarding Drop Everything And Read–Dr. Jonathan Hart, Superinten- adding a third eastbound lane to Route 22 for right turns onto Coundent of Schools in Readington Township, commemorates Dr. Seuss’s birthday ty Line Road. Meanwhile, the interas Whitehouse School engages in DEAR (Drop Everything And Read) time. Rev. Elizabeth Estes section is being updated as part of Pictured with Dr. Hart are Kailea Vandermeyde (second grader), James Readington Reformed Church Advance Realty’s housing developMaraventano (kindergartner), and Joseph Granton (first grader). welcomes Rev. Elizabeth Estes, a.k.a. –Submitted by Ann T. DeRosa, Ed.D., Principal, Whitehouse School ment on westbound Route 22 on the Pastor Liz, as its new, energetic pastor Branchburg side of the intersection. and the Township as a whole. We also believe that a compromise with the owners of the Airport is in everyone’s best interest. If the Airport is willing to agree to give up its demand for unreasonable expansion, the Township will work with it to allow it to modernize its facilities, address existing safety concerns and compensate it for establishing permanent size limitations. Such a solution could be a win-win-win for the Airport, the nearby residents and the whole Township.” In the decades-old legal battle, the township after a public referendum had sought to acquire through eminent domain the development rights to the 102 acres of the Solberg property used for the airport and acquire the remaining 624 acres. The Appellate decision stated that the township could pursue future condemnation proceedings with the Federal Aviation Administration and state Department of Transportation. proceeds will benefit the Rosary Altar Society Scholarship Fund. For information contact Gerry Boylan: grandknight.6930@gmail.com. Station. There will be live music, door prizes and warm-up exercises. Registration starts at 9 a.m. and the cost is $20. Call 908-534-2077 or register online at www.readingtonreformed.org and get a T-shirt. Proceeds will benefit Family Promise of Hunterdon County and Readington Reformed Church. Relay For Life May 3 This cancer awareness event will be held at 6 p.m. at the Robert Everitts Fairgrounds, 1207 Route 179, Lambertville. To find out more go to www. relayforlife/HunterdonNJ or call Tracey DePano at 484-325.0126. Plan to walk a few laps, to join a team or to donate. Take-Out Roast Beef Dinner May 4 The Readington Reformed Church, 124 Readington Rd., is having a TakeOut Only Roast Beef Dinner from 4:30 to 6:30 p.m. Tickets are $17, and advance tickets are highly recommended. Call Pat at 908-526-8572 to order your tickets no later than April 24. Tickets also will be available at the door beginning at 2 p.m. on the day of the dinner. © 2 015 C o ld w e ll B a n k er R e a l E st a te L LC. C o ld w e ll B a n k er® is a re g ist e re d tra d e m a rk lic en s e d to C o ld w e ll B a n k er R e a l E st a te L LC. Coldwell LLC. A n E q u a l O©p p2015 o r tu n ity C o m pBanker a n y. E qReal u a l HEstate o u sin g O pColdwell p o r tu n ity.Banker® O w ne d isa nadregistered O p e ra te d trademark b y N RT L L C.licensed to Coldwell Banker Real Estate LLC. An Equal Opportunity Company. Equal Housing Opportunity. Owned and Operated by NRTLLC. sons included in their curriculum. Schools that have participated in the program have a big streamside celebration when the fish are released. The Preschool of Whitehouse United Methodist Church will conduct its annual Used Clothing Drive and fundraiser April 12 - May 1. Drop off items in the “Goat Barn” (to the left of the playground) at the church, 73 Old Highway in Whitehouse. Collection items include wearable used clothing, shoes, belts, handbags, linens, stuffed animals, and toys. For a complete list, see informational flyer posted on the school website: preschoolwhitehouseumc.com. Contact Chris Scheick, Director, preschool@ whitehouseumc.org or 908-5346333, for more information. What is Blue Light? Blue light is a high-energy light emitted by devices (computers, tablets, smart phones) that has been shown to contribute to digital eye strain Dry Eyes? Blurred Vision? Fatigue? Headaches? PROUD TO BE YOUR READINGTON REALTORS We have the experience and knowledge in helping you, your family, and friends in buying, selling, and relocating. Any questions? We are just a call away. Proudly serving our local communities since 1987. Hunterdon Medical Center will host the 15th Annual Baby, Tot and Kid Fair, a free event for expectant parents, new families and parents of toddlers and young children on Saturday, April 6, from 9 a.m. to 1 p.m. in the Main Lobby of the hospital. Topics include Obstetricians, Midwives, Pediatricians and Family Practice Physicians, The Maternity and Newborn Care Center and tour facility, Lamaze and Hypnobirthing classes, Parenting Education Classes, Child Care Providers, Preschools, Nutrition, Breastfeeding, and Community classes for children. During April, Hunterdon Medical Center is sponsoring the United Way of Hunterdon County and NORWESCAP’s Diaper Bank. All attendees who bring in a box of diapers to help support this drive will be entered in a prize drawing to win a car seat. For more information, visit www.hunterdonhealthcare.org. In keeping with updating outdated Township ordinances, the Planning Board has spent the last few months reviewing and updating the sign ordinance. This ordinance dictates what types of signage can be displayed in Readington in all zones. The Planning Board is not enabling any larger signage around town but, rather, the Board is looking into new forms of signs from feather flags to LED lighting to determine what fits best into our community. The Board is talking with the Readington Business Association to get feedback from our businesses in town and encourages residents and business owners to attend a future Planning Board meeting to provide any thoughts on this matter. The Planning Board will also tackle Floor Area Ratio regulations and Zone Ordinance updates for the Route 22 corridor in 2019. Environmental Commission Realignment The Environmental Commission (EC) had its first monthly meeting of 2019 on February 5th. The Commission discussed observance of Earth Day 2019, in cooperation with Hunterdon County Parks and Recreation, focusing on reduction of single-use plastics, as part of a larger long-term initiative. Stan Prater, Area Manager for Jersey Central Power and Light, appeared at the October 1 Township Committee meeting to outline the company’s four year infrastructure improvement plan. The plan includes investing $400,000,000 in new equipment and system enhancements along with more aggressive tree clearing. It will also include smart technology to assist in locating and minimizing outages, and replacing substation equipment. This plan will necessitate a slight rate increase for customers. Mr. Prater requested a resolution of support from the Township, but the Committee decided to wait to learn more about the clear-cutting of trees before considering such a resolution. In light of the power outages from the most recent winter storm, members of the Township Committee will schedule a meeting with Mr. Prater to examine areas of the Township which were particularly hard hit to see if some selective tree trimming might alleviate future power outages. 2nd Quarter Property Taxes for 2019 are due MAY 1. Two (2) subcommittees of the EC were created: the Wildlife Advisory Committee, focusing on deer and other wildlife concerns and interests, and the Tree Advisory Committee, which will address invasive pests and diseases, tree ordinance, community forest management plan, and other issues involving Township trees. Township residents are welcome to attend meetings, the dates of which are listed on the Township website, and those interested in participating in the efforts of these committees can contact Commission Secretary Ann Marie Lehberger at planning@readingtontwp-nj.org. Township Considers Two Affordable Housing Sites At the February 11th Planning Board and the March 4th Township Committee meetings, ordinances for two Affordable Housing zones were considered in Readington’s continued efforts to meet State mandated Affordable Housing quotas. The development on Route 22 West known as Readington Commons in Whitehouse Station would be rezoned to include residential housing. Approximately 254 residences will be permitted with a 25% set aside of 64 identified as affordable units. The original commercial development was never fully completed, and these new homes will be on the same footprint as originally approved. The second would be the redevelopment of the former steel mill abutting the NJ Transit rails at the end of Mullen Road on Route 22 East. Approximately 192 residences would be permitted with a set aside of 48 identified as affordable units. The Township is planning to establish, with State approval, a new road from this location with an outlet on Route 22 East likely through the space which the long abandoned and dilapidated Whitehouse Diner now occupies. The Township is working to convert Mullen Road to a cul-de-sac with no access to the new development. It is important to note that municipal obligation does not include ensuring that these developments are constructed. Rather, it is Readington’s obligation to provide a reasonable opportunity for Affordable Housing to be developed within the Township. 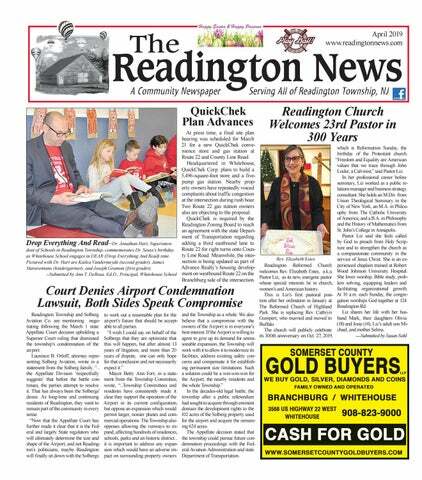 Readington continues working towards a full court approved agreement with the lowest totals possible sometime in 2019 for its 3 rd and 4th round obligations. Catch a look at our newborn bison calves (aka red dogs), haywagon tours, interactive displays from local farms and agricultural agencies such as Valley Crest Farm, Profeta Farm, Schaeffer Farm, NJ SADC and NJ RC&D. Learn about conservation, organic farming, preservation of farms, and river friendly farming. Plus a Free kid’s wooden craft by Home Depot from 12-2, facepainting, make your own bug repellant, local craft vendors, bison burgers and franks, and live music! Are you responsible and compassionate? Change lives. Build futures. Full Time & Part Time Opportunities Available in Ringoes, Frenchtown & Milford! CONTACT US: (908) 874-8686 ∙ LarkenAssociates.com IMMEDIATE OCCUPANCY • BROKERS PROTECTED No warranty or representation, express or implied, is made to the accuracy of the information contained herein and same is submitted subject to errors, omissions, change of price, rental or other conditions, withdrawal without notice and to any special listing conditions, imposed by our principals and clients. *When you sign a month-to-month lease. Are you overwhelmed by the task of searching for the perfect senior housing options for your loved one? I CAN HELP guide you through the maze of senior housing options. Inducted into the Readington Middle School Chapter # 8355 are: Jake Altom, Faith Brennan, Neela Bruen, Sophia Castillo, Sam Chatterjee, Megan Corbin, Jenna Dambres, Dan Eyler, Anya Fenn, Payton Fisch, Tyler Francfort, Cadence Funk, Dana Hennings, Andrew Ippolito, Caitrin Lynch, Vivian Marr, Ryan Mierzejwski, Sofia Nyez, Ricky Rodriguez, Ally Ross, Kaitlin Sorrentino, Olivia Stapleton, Dan Szymanski, Hannah Vasson, Audrey Watson, and Ava Zimliki. Lebanon Reformed Church will hold the 5th Annual We Shall Over-Run 5K Race / 1 Mile Walk on Saturday, May 4, in Lebanon Borough. Race start is 9 a.m. This year the race will be dedicated as a celebration of the life of Rev. Rebekah (Becky) Pratt (Stanton Reformed Church). Proceeds from the race/walk will benefit Hunterdon Hospice and The Rebekah Pratt Legacy Campaign. Online registration is now open to accept your entries and additional donations (if you choose) at: https://runsignup.com/Race/NJ/ Lebanon/WeShallOverRun5K The race committee is seeking sponsorships for the race. Sponsors will have their names and/ or businesses printed on the race shirts and recognized on the online registration page. If you or your business would like to help sponsor, or for more race info, contact Meg Slutter at 908-797-3614. The 14th Annual Readington Township Memorial Day Parade is set for Monday, May 27, beginning at 10:30 a.m. at the King’s Plaza Shopping Center parking lot. It will proceed down Main Street (Route 523) in Whitehouse Station to the Municipal Building, where a Memorial Service and Flag Raising will be held to commemorate those who fought and died in service to our country. This ceremony will be followed by Community Day in Pickell Park, directly behind the Municipal Building. Free hot dogs and snacks will be provided, and there will be music and activities for the whole family. For more info email readingtonparade@comcast.net. Vendors are invited to sign up for the Whitehouse Rescue Squad’s 21st Buffalo Watch, Collectables & Craft Fair to be held Saturday, June 1, from 9 a.m. to 5 p.m. at Readington River Buffalo Farm, 937 Co. Rt. 523, Readington Township. Rain Date June Quilts for Kids–The Knights of Columbus Bishop Edward T. Hughes 8. The family event will feature Council 15540, St. Elizabeth Ann Seton Church, Three Bridges, contributed wagon ride tours to see the new$1,000 for material purchases to Quilts for Kids on Feb. 7. Quilts for Kids born calves on an authentic worksupports a network of volunteers who produce and deliver thousands of ing buffalo farm. There will be patchwork quilts to comfort children facing serious illness, injury or trauma pony rides, face painting, live in hospitals throughout the country. More information can be found at www. music, a beer saloon, antique and quiltsforkids.org. Council members delivered 115 of their quilts to St. Peter’s craft vendors, hot sauce experts, Medical Center for pediatric and neo-natal intensive care unit patients at the 4-H animals, and plenty of food. hospital. Pictured delivering the quilts to Alexa Curtiss, Certified Child Life Interested vendors should visit Specialist, St. Peter’s, are Andrew S. Casella of Quilts for Kids and Thomas the squad website at www.whiteMonroe and Edward Koch, of Council 15540. houserescue.com for registration –Submitted by Tom Monroe information. Readington River Buffalo Farm, 937 Route 523, invites the public to celebrate the newborn bison calves at Red Dog Day on May 5 from 9 a.m. to 5 p.m. In addition to hayride tours to see the spring crop of calves, the day will be filled with activities that highlight the many efforts that farmers take to keep the air, water, and soil healthy. Live music by Ed Jankiewicz and Thomas Johnston, a food court, beer at the farm’s saloon, and a craft bazaar will be featured. There will be face painting, makeyour-own bug repellant, and a free wooden craft for kids sponsored by Flemington Home Depot from noon to 2 p.m. Free admission, and most activities are free or under $5. monthly for county residents age 60 and older at the Senior Center Café, 4 Gauntt Place, Flemington Building 1, Lower Level at 11:45 a.m. Suggested donation is $5.25. Call the office at 908-284-0735 to register. April programs are: Lunch and Learn Program (Nutritional Education) Wednesday, April 3. Vitamins and Minerals – B Vitamins & Deficiency A “Lunch N Learn” presentation and nutritious meal. Social and Presentation Lunch Thursday, April 25. “Seniors on the Go” presentation by goHunterdon. Learn about driving and pedestrian safety through a fun game. —Submitted by Mary Faust, Assistant Director, Meals on Wheels in Hunterdon Inc.
RSVP to 908-534-0026 by April 5 All 2½ to 4 year olds welcome. Bring a friend! tic Surgery and Medspa, Naveen Ballem MD, Advanced OBGYN, Hunterdon Hematology Oncology, ShopRite and MidJersey Orthopaedics. When asked why lead sponsor, Advanced Heart & Vascular Institute of Hunterdon, was enthusiastic about supporting this event, Dr. Andrey Espinoza responded “As a cardiologist, I have conversations regularly with patients who may find themselves in the position of making difficult choices based on the costs of their medications and am grateful for the opportunity to give back to the community we serve.” For more information and to purchase tickets, visit www.winewomenandshoes.com/hhf or call the Hunterdon Healthcare Foundation office at 908-788-6591 or email ddalley@hhsnj.org. By Melody Landon Simerson and Jeannie Vitale, Three Bridges Librarians Spring Forward to Three Bridges and Readington Libraries for books on spring gardening and travel tips. It’s that time of year. We also have books for those of you who are “bunny and bird lovers.” A big thank you to Robert Post who helped with keeping Three Bridges shelves nice and tidy for the extensive collection of DVDs. He designed and cut materials for each shelf so that the DVDs would not slide to the back of the shelf. Congratulations to the winners of the Three Bridge’s Valentine’s Candy Heart Guessing Contest: Dayana Reeves (child) and Jennifer Price (adult). Thank you to everyone who stopped by and participated. Readington Library is closed Good Friday, April 19, and Three Bridges Library is closed Good Friday, April 19, and Saturday, April 20. Wanted: Old Crayons The Preschool of Whitehouse United Methodist Church and the WUMC Sunday School are collecting old, used, and tired crayons for The Crayon Initiative – a unique charitable organization that recycles crayons and distributes them to children’s hospitals, brightening the lives of young patients while reducing environmental waste. Crayons (In Ziploc bags) can be dropped off and left by the parking lot door to the church, 73 Old Highway in Whitehouse, now through May 5. Contact Chris Scheick, Director, preschool@whitehouseumc.org or 908-534-6333 for more information. called The Jersey Central for over 100 years. Clinton Station was opened May 1852 with the railroad cars making one round trip daily from Clinton to New York. The long and tedious endeavor was finally completed from New York to Easton July 1, 1852. On July 2, 1852 excitement burst out along the whole line when the great engine “Pennsylvania” pulled several people-filled cars decorated with bunting, waving flags, with music blasting, the whole length of the railroad where throngs gathered along the line to view this marvelous happening. Completion of the line caused a great economic upswing – Pennsylvania coal was transported to heat city houses, farmers found markets for fresh crops, manufactured goods became easily available, housing grew up around the railroad (Whitehouse Station.) People literally could, by changing a few trains, travel anywhere in the United States. So successful were the railroads that there were, at one time, 33 daily trains through White House alone. How sad to see an excellent, comfortable travel mode almost disappear. The Railroad opened the whole country economically and socially, to those adventurous enough to travel and explore. TO PLACE A CLASSIFIED AD: Type your ad exactly as you want it to appear. Ads are limited to 30 words (phone numbers count as one word). Mail your ad along with a check for $20 made payable to “The Readington News” to The Readington News, PO Box 5351, Branchburg, NJ 08876 Caregivers Wanted! Comfort Keepers of Flemington is seeking kind, caring, reliable and compassionate caregivers. Flexible Hours. Full-Time, Part Time, Weekends and Overnights. Top Pay! For more information call: 908-806-3768. FOSTER CAT, Claudette, is looking for her forever home. A stunning b/w cat with a beautiful fluffy tail, sweet, soft and loves to play. Call 908-246-8836 for more information. RITTER BROTHERS PAINTING, Readington, NJ. Interior & Exterior. Business: 908-2338904, Home: 908-534-9390. Lic#13VH10329300 K&J Tree Service, LLC: Tree and Stump Removal, Pruning, Storm Damage, Clean-Ups, Mulch. Reliable and Responsible. Licensed and Fully Insured. Call for a Free Estimate 908-9633384. People have been thinking about spring for months, but now, with all the potholes, they’re thinking more about the springs on their cars. What do you call a snowman in April? A puddle. At baseball opening day, which player will be wearing the biggest cleats at Railroad Avenue? The one with the biggest feet. How can you pitch a winning baseball game without ever throwing a ball? By only throwing strikes. Hind & Fore Inc. Inc. Celebrating our 53rd Celebrating 53rd Anniversary! Anniversary! Did you know that the Easter Bunny’s favorite state capital is All-Bunny, New York? Quality Meats & Seafood Celebrating Our 50th Anniversary! “We Build Memories Memories Mealatata aTime” Time” Celebrating our 53rd One Anniversary! “We Build Meal ORDEROne NOW! !